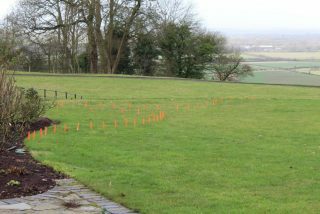 Last year’s garden visitors will remember that we didn’t like the transition area between the West Garden and orchard: we felt that the sight lines fell away to a series of fences and drew the eye away from the western views. To fix this, we decided to change the shape of the left hand side border and create a planting block that would hide the fence lines and funnel the view. 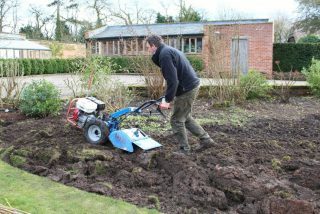 We had to wait until late winter before we could embark on this exciting project. 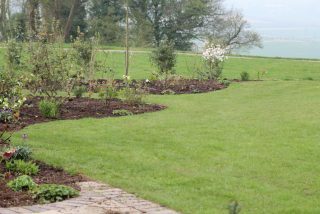 First, we removed the plants in the left hand side border to create an empty canvas. 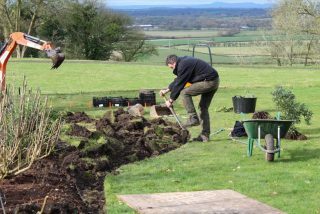 Next, the shape of the new border, which consists of two parts with a path leading to the orchard, was pegged out. Once we were happy with the way the design looked from different angles, the grass was removed and the shape of the border cut out. 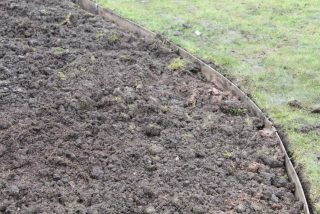 Next, the soil was rotovated and the final shape defined by inserting steel edges. Smoothing the curves with steel edges. At this point, we panicked at the sheer size of the new border. 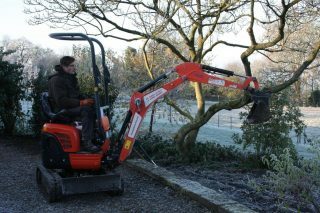 Were the three hundred shrubs and perennials we had ordered going to suffice…?! 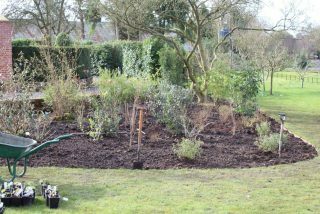 Once we’d planted the trees and shrubs, we were relieved to see the backbone of a well-proportioned border emerging. 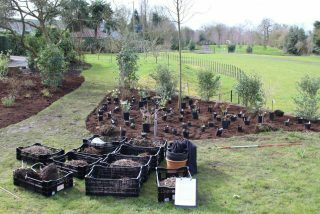 Trees and shrubs form the backbone of the new border. Adding the perennials finally put our mind at rest. A few hours later, the work was completed. We can’t wait to see the new plants taking off!